ODD how a surprise gift from the past—in this case, a medium-format camera inherited from a deceased relative—can rekindle an interest left dormant by advancing time and technology. According to a faded receipt, the camera in question, an early Rolleiflex Automat, was bought in 1937 by an uncle and taken back to Africa, where he was a missionary doctor. On his return to Britain many years later, the camera was put into storage where, for some unfathomable reason, it remained untouched for the better part of half a century. Your correspondent wrote late last year about the pleasure he gets on all-too rare occasions from firing up his ancient Hasselblad SLR (single-lens reflex) camera and shooting off a roll or two of 120 colour-reversal film (see “Point, shot, discard”, December 31st 2011). The sudden acquisition of the Rollei TLR (twin-lens reflex) has renewed his passion for medium-format cameras with their attractive 6cm-by-6cm picture frame. But before loading one of the rolls of 120 film he keeps stashed in the fridge, he considered it best first to have the old Rollei cleaned, lubed and adjusted. Leaving the 75-year-old antique with a local camera shop was out of the question. Clearly, the work would have to be done by a technician who understood the foibles of this legendary piece of equipment. But who? 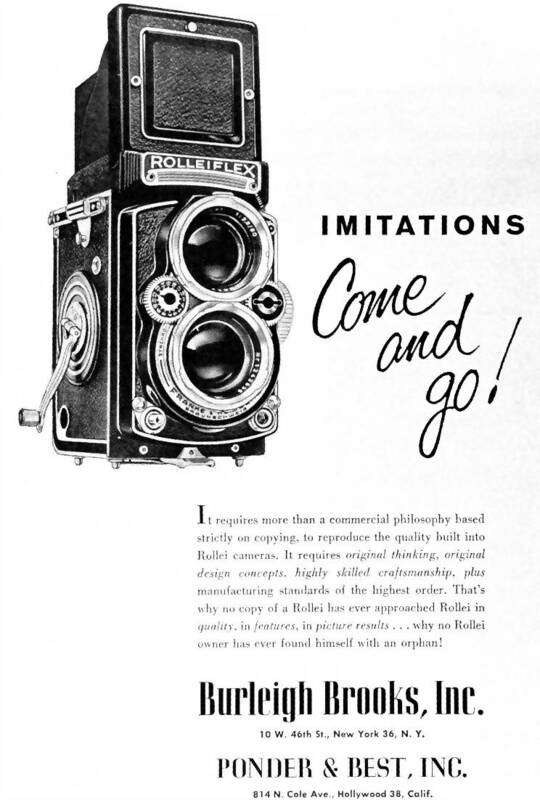 Rolleiflex cameras were made by Franke & Heidecke in Braunschweig, Germany, from 1929 until the firm went bust in 2009—a victim of rising costs, the recession and changes in the marketplace. DHW Fototechnik, a firm resurrected from the ashes of Franke & Heidecke by former employees, continues the good work, albeit on a reduced scale. A trawl of the internet netted just two sources of technical expertise with the requisite reputations. In Frankfurt, there was Jürgen Kushnik, who had learned the trade at RolleiWerke in Braunschweig, and had risen through the ranks to become branch manager of Rollei of America, before returning to his native Germany. The other was Harry Fleenor, who had spent over 45 years repairing Rolleis at factory service centres in the United States. When the company went out of business, Mr Fleenor bought all the test gear from Rollei of America and set up shop in Manhattan Beach, California—just 15 miles down the coast from where your correspondent resides. With camera in hand, he was round at Mr Fleenor’s repair shop in a trice. No question that Oceanside Camera Repair in Manhattan Beach has a global reputation among Rolleiholics. Endorsements from around the world cover the walls of Mr Fleenor’s store. The business has so much work on hand that your correspondent will be lucky to get his refurbished Rollei—complete with a new Maxwell screen—back before Christmas. That alone speaks volumes about the resurgent interest in the brand. In fact, analogue cameras generally are enjoying something of a revival. In part, this is due to the plethora of old film cameras that can now be had for a song on eBay and elsewhere. Over the past decade, professional as well as amateur photographers have flooded the second-hand market with analogue cameras in excellent condition as they traded up to ever-more exotic digital models. But something more fundamental is at work as well. Tales abound in photographic circles about an irreverent band of shutterbugs who have become disillusioned with digital. Your correspondent can understand why. On the one hand, he appreciates the way digital cameras let him experiment endlessly by taking numerous shots of a scene, each time with a different exposure setting, and then deleting or editing the less successful ones until an all-but perfect image remains. On the other hand, he enjoys the challenge and forethought involved in setting up a shot with an analogue camera. The discipline of having only a dozen shots on a roll of 120 film concentrates the mind no end. Making every image count heightens the sense of achievement. While modern digital cameras are marvels of automation, they have become almost too efficient at doing their job. Lost in the process is a sense of personal satisfaction that comes from solving the exposure equation oneself. It is hardly surprising that a growing number of people find them more than a little sterile. What is surprising, though, is that—despite all the wonderful old cameras and lenses on the secondhand market that are capable of taking pin-sharp pictures—today’s analogue renaissance is being invigorated largely by a movement that preaches “low-fidelity” photography. The movement, known as lomography, gets its name from a toy camera made by the LOMO optics company in the former Soviet Union. The Lomography Society, founded in Austria in the early 1990s, comprises both a world-wide community of users and a company that produces a line of cheap analogue cameras and film for enthusiasts. Lomographers advocate spontaneity and favour optical distortion and intense colour saturation in their pictures. Cheap cameras with plastic lenses help create the distortion, while any leakage of light into a camera body is accepted as part of the creative process. In rejecting the values of classical composition and processing, lomography is closer to abstract art than analogue photography. One particular trick lomographers use widely is cross-processing. This involves processing colour positive film for slides (normally developed using the so-called E-6 process) using the chemistry for developing colour negative film for prints (the C-41 process). This produces images with the intense saturation and high contrast that are prized by the community. Occasionally, the technique is reversed, with colour negative film being developed as if it were slide film. This muddies the colours and flattens the contrast. Yet another technique, called redscale processing, is employed when colour print film is deliberately loaded into the camera back-to-front, allowing the film to be exposed from the wrong side. The resulting images have a strong red cast. The best thing about the global lomography movement, though, is not so much the abstract images it celebrates, but the way it has helped revive the dying business of film processing. For that, analogue photographers everywhere can rejoice. And thanks especially to the lomography movement’s enthusiasm for the Lubitel, a simple medium-format TLR made in Russia by LOMO, online services have sprung up to process 120 roll film properly, quickly and at reasonable prices. Two of the most successful online labs today are 120processing.com and oldschoolphotolab.com. With his recently acquired Rolleiflex, your correspondent is looking forward to becoming more knowledgeable about TLR photography. Having, until recently, taken most of his pictures with either an analogue SLR or a rangefinder camera, he has evidently much to learn about “waist-level” imaging. In certain ways, TLRs are simpler than SLRs. Because they use two separate objective lenses riding on the same focusing carrier—one for the viewfinder, the other for taking the actual picture—no mechanism is needed to prevent light from reaching the film while the image is being focused. To block the light, a traditional SLR needs either a noisy focal-plane shutter, or the reflex mirror itself is made to do the job. In either case, the mirror has to be flipped out of the way when the shutter is depressed, so light can pass from the lens to the film. By contrast, the reflex mirror used in a TLR (for turning the light through 90º so the image can be seen on the big ground-glass viewfinder on the top of the camera) is fixed. Not having to be flipped out of the way, there is therefore no shutter lag. Like a rangefinder camera, a TLR takes its picture the instant the shutter is released. That comes in handy in street scenes and other situations involving sudden movement. No wonder the Rolleiflex was used so widely on the battlefield by photographers on both sides during the second world war. Your correspondent feels privileged to follow in their footsteps.